What International Airlines Offer 24-Hour Fare Holds Or Refunds Within 24 Hours Of Booking? You can spend months, and thousands of dollars, putting together a trip abroad, but no matter how much effort you take to avoid travel trouble, unforeseen circumstances can force you to change your plans. Thankfully, most airlines flying to and from the U.S. have a policy that lets passengers cancel tickets within 24 hours of booking. Note that we said “most airlines” — not all. • All commercial airlines doing business in the U.S. must offer a 24-hour window for most travelers to back out of their reservation. • Airlines can choose to either allow travelers to cancel their tickets within 24 hours, or choose to place a 24-hour hold on a reservation. • Most airlines only offer the cancellation option. Some offer both. American Airlines & Turkish Air are two of very few who only allow the hold option. • To take advantage of the hold, you have to actively opt into it. Paying for your ticket when you book means you no longer have the choice to back out of the reservation. As we’ve mentioned before, in 2012 the U.S. Department of Transportation put in place new guidelines [PDF] requiring that all commercial airlines flying into and out of the country to give travelers who book their flights at least seven days in advance a 24-hour window to back out of that purchase. There are two ways an airline can choose to follow that rule — by either giving passengers 24 hours after booking to cancel their ticket without penalty, or by letting them choose to place a hold on that reservation for 24 hours before charging them for their ticket. Almost all major airlines, both domestic and international, have the 24-hour cancellation window as their default. Some offer both the possibility to cancel and the option to place a one-day hold. Very few only give customers the choice to hold their reservation, so many travelers assume that they have 24 hours to nix a ticket. If they assume incorrectly, it could end up being a costly mistake. Consumerist reader “John” (Not his real name; you can tell by the quotation marks) was somewhat familiar with the 24-hour rule when he booked an upcoming flight on Turkish Airlines. So when his plans changed almost immediately after booking, he thought he’d be able to cancel because he was still within the 24-hour window. Unlike other airline’s cancellation policies, which do not require the customer to take any action in order to enjoy the brief window of protection, customers of Turkish Airlines and American Airlines must actively opt in to the 24-hour hold. That means that travelers who don’t notice this option — or don’t even know it exists — and pay when they first book their travel, they have no way to get that airfare back without penalty. John tells Consumerist he purchased four flights on Turkish Airlines for a February trip from San Francisco to Dubai. When he found out that the carrier still flew over Syria and parts of Iraq, he felt it may not be the right route for his family. According to John, he didn’t know that the airline only subscribed to the “hold” option because the carrier charged his credit card immediately after he booked the flight. “As far as I could tell they never told me about this 24 hour hold,” he tells Consumerist. So is the opt-in for the “hold” window really that hard to find on the Turkish Airlines site, or did John somehow miss an obvious box that he should have checked? 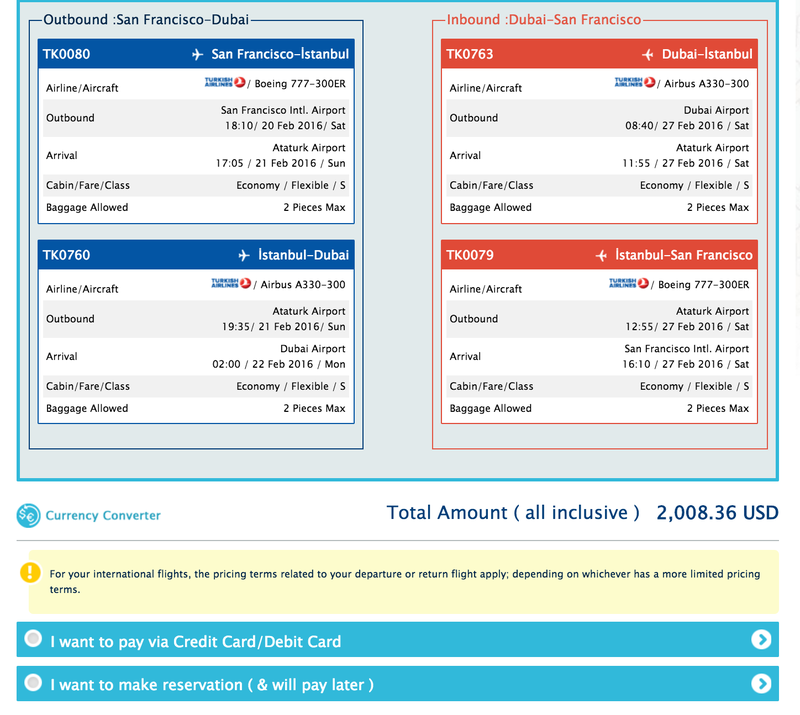 We went through the process of booking a flight (well, everything except actually buying the ticket) on Turkish Air from San Francisco to Dubai Consumerist. Instead, a potential passenger would have to read through several sections of the Terms and Conditions, or General Conditions of Carriage documents for pertinent information, including a cancellation timeframe and where you can cancel the purchase. So let’s continue to follow the “Reserve (& Pay Later)” path. After selecting this option, you receive a confirmation email stating that the fare must be paid for in 24 hours or the itinerary would be canceled. We went so far as to reserve that flight from San Francisco to Dubai. Through the resulting confirmation email, we were able to access our not-yet-paid-for reservation and were given a specific time in which the flight price would expire if not officially purchased. As opaque as the hold process might be, actually canceling the reservation was fairly simple. 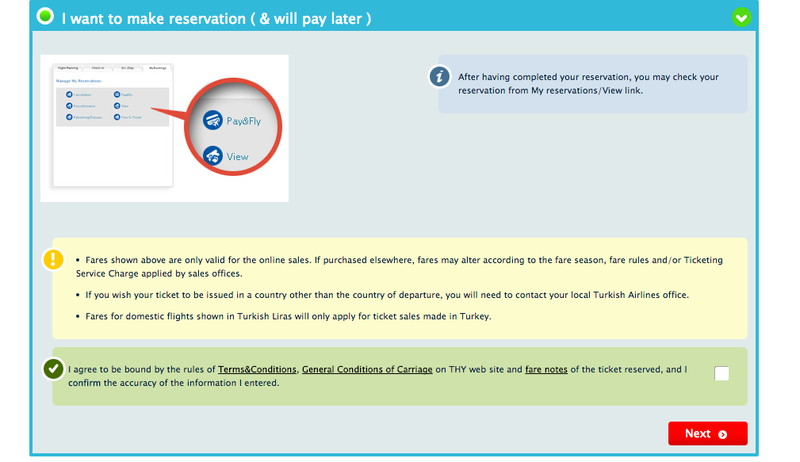 We were able to look up our reservation on the Turkish Airlines website using the code provided in our confirmation email. From there we clicked the cancellation button and checked the box to ensure that was really what we wanted to do. While Turkish Airlines’ policy may be difficult for some to find on their website, it appears to fall in line with DOT guidelines. To ensure airlines abide by the 24-hour reservation hold or cancellation policy, the DOT checks websites for both domestic and international carriers periodically and investigates consumer complaints. Any airline found to be in violation of the rules is subject to a civil penalty of up to $27,500. Still, the process doesn’t help Z. who now has four tickets to Dubai he’d rather not use. For now, he’s contacted his credit card company about a possible charge back. While it’s possible that airlines may choose to change their preferred option under the 24-hour hold or refund regulation, here are the current policies (as of Feb. 2016) for more than a dozen major international airlines flying to and from the U.S.
Air Canada N Y Passengers can receive a refund of the price of their ticket or cancel the transaction within 24 hours. Air France N Y Travelers can request your refund within 24 hours of purchase. Air India N Y Air India allows you to cancel reservation without penalty and receive 100% refund if you cancel within 24 hours of purchase. Avianca N Y Travel booked through Avianca’s U.S. ticketing locations, U.S. telephone reservations line, or U.S. website can be canceled without penalty and refunded within 24 hours of purchase, if the reservation is made one week or more prior to scheduled departure date. British Airways N Y You may cancel a reservation made on ba.com or through the British Airways call center within 24 hours of ticketing for a full refund by calling British Airways, as long as the booked travel is one week or more from the date of purchase. Cathay Pacific Airways N Y Bookings made at least one week before departure via Cathay’s U.S. site, involving itineraries to/from U.S., can be canceled within 24 hours after purchase for full refund. Emirates N Y For itineraries booked on Emirate’s U.S. website involving flights to or from the U.S., where the booking is made at least a week before departure, you may request a refund within 24 hours of booking without penalty. Japan Air N Y Tickets can be refunded without penalty for online reservations if requested within 24 hours after completing the reservation. KLM Royal Dutch Airlines N Y You can apply for a refund if you want to cancel your ticket within 24 hours after booking. LAN/TAM Y Y LATAM will allow reservations to be held at the quoted fare without payment, or if purchased, cancelled without penalty, for at least 24 hours after the reservation is made if the reservation is made one week or more prior to the flight’s scheduled departure. Lufthansa Y Y Customers can hold a telephone reservation made directly with Lufthansa’s telephone reservation center without payment for up to 24 hours. Or, customers can cancel their reservation without penalty, for at least 24 hours after the reservation is made (on the phone or online), if the reservation was made at least seven days prior to departure. Qantas N Y Customers who purchase a ticket in the U.S. may cancel their reservations and obtain a ticket refund without charge within 24 hours of ticketing when purchase is one week or more prior to departure of the first flight in the itinerary. Singapore Airlines Y Y Consumers can cancel a reservation made using the Singapore Airlines website without penalty for 24 hours after the reservation is made. Or the airline will hold a reservation for 24 hours without payment. In either case, the reservation must be made at least one week prior to the scheduled departure. Turkish Airways Y N Reservations can be held for 24 hours at a quoted fare, as long as the booking to/from the U.S. is one week or more prior to your flight. Virgin Atlantic Y Y Passengers can hold a telephone reservation at the quoted fare without payment, or they can cancel a website booking without penalty for a maximum of 24 hours after the reservation is made, as long as that reservation is made one week or more prior to scheduled departure.